This amazing map is hooked! 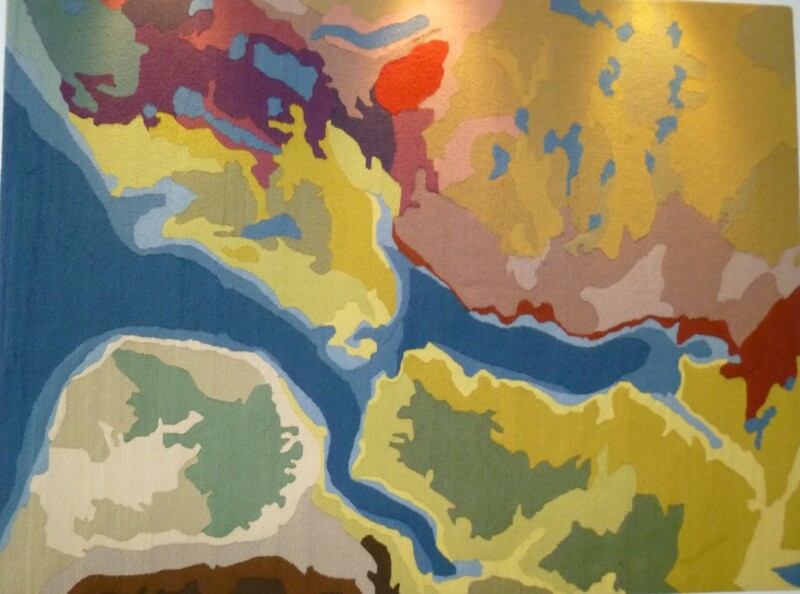 It hangs in the Visitors’ Centre in Gros Morne Park, Nfld. We visited this magical place a couple of years ago. Every vista was a potential hooked rug. Makes me want to get back to my hooking frame. Now that our shows are over–thank you so much to everyone who came both in Kingston and Belleville! They were a great success. But now that they are over, I want to get back to hooking. Fireworks awaits. I have three border sides left and promise myself it will be done by spring. 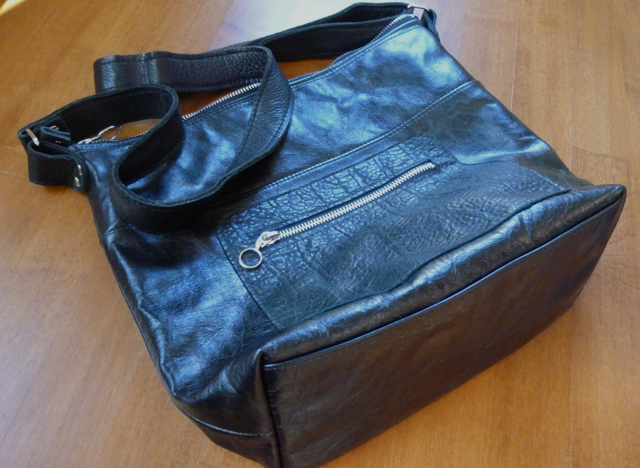 The top bag is another version of the Keller Bag–this one is great black upholstery leather with reinforced bottom panel, adjustable shoulder strap and exterior and interior pockets. 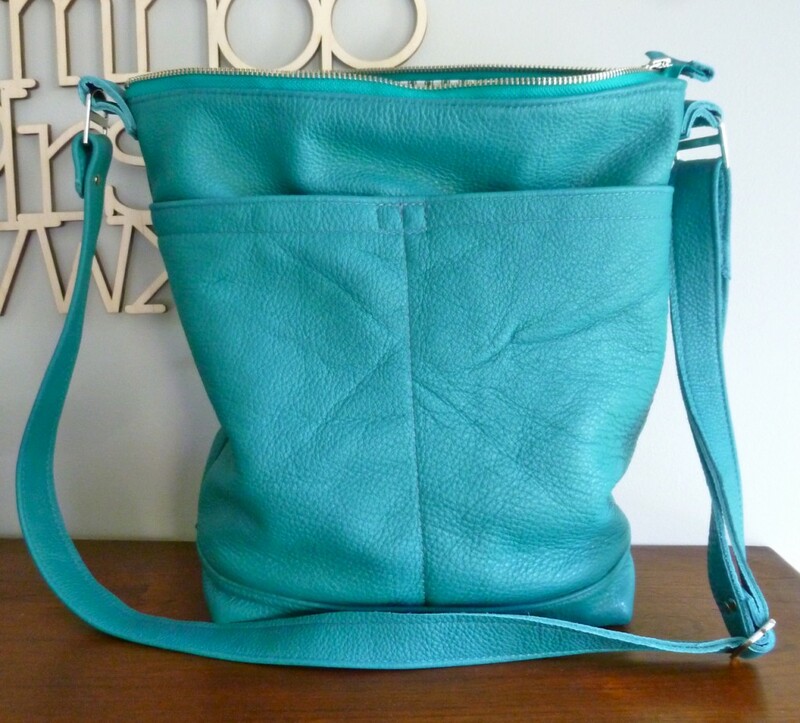 The next is a red Luna Bag; like the turquoise one here, it has a double pocket on the front, adjustable shoulder strap and interior pockets. 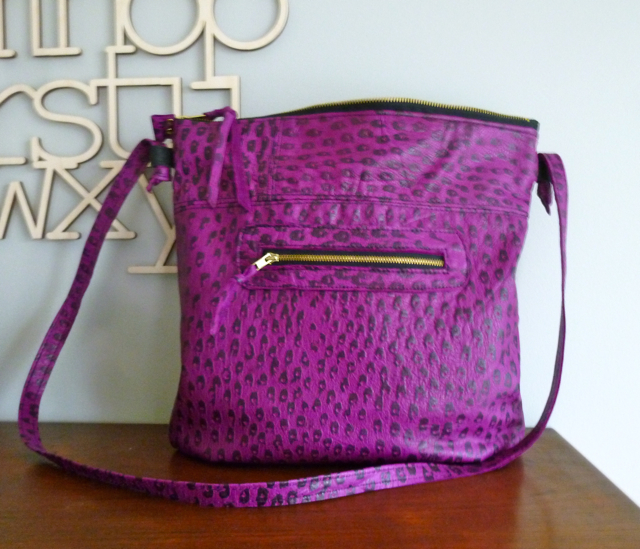 The final one is the Slouch, in this version in fuschia flocked leather. 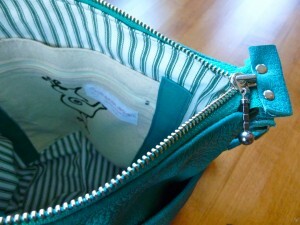 It has a front zipper pocket and an interior one and a narrow adjustable shoulder strap. I’m doing little drawings for the tags, so just getting them all straight. These bags will be available tomorrow at the show as well as much more. Hope to see you. It’s been a bit mad here, trying to get everything ready for a couple of small shows. 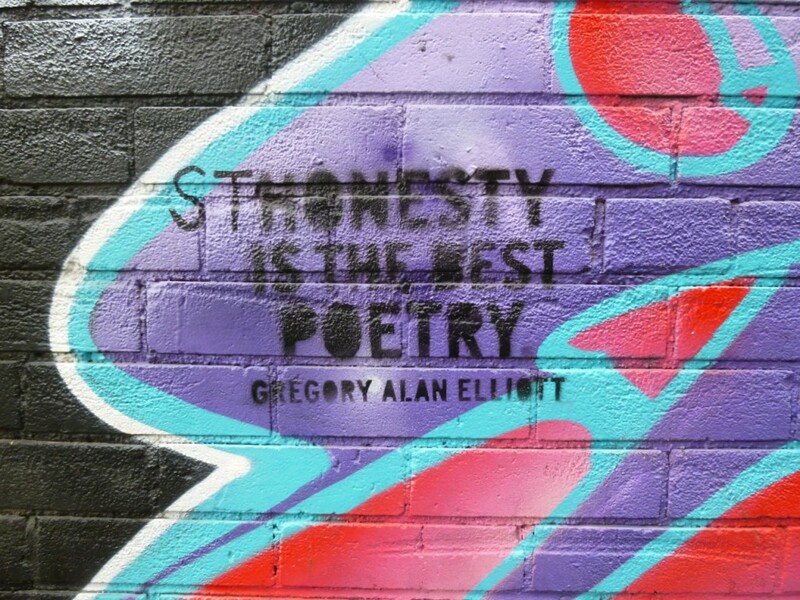 But sometimes your best work comes out of that pressure hothouse, that manic activity. Ideas flow and magically come to fruition. 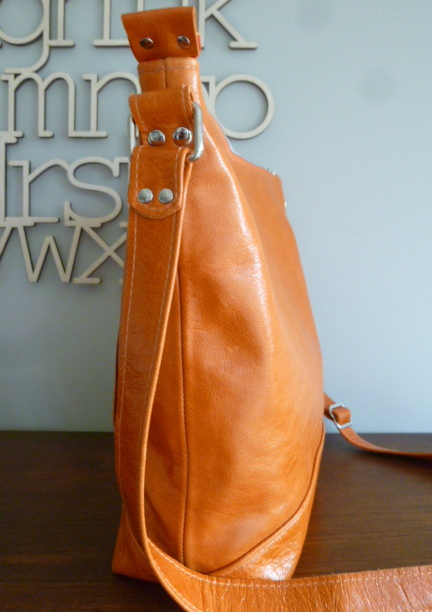 Below is the Orange Keller Bag. 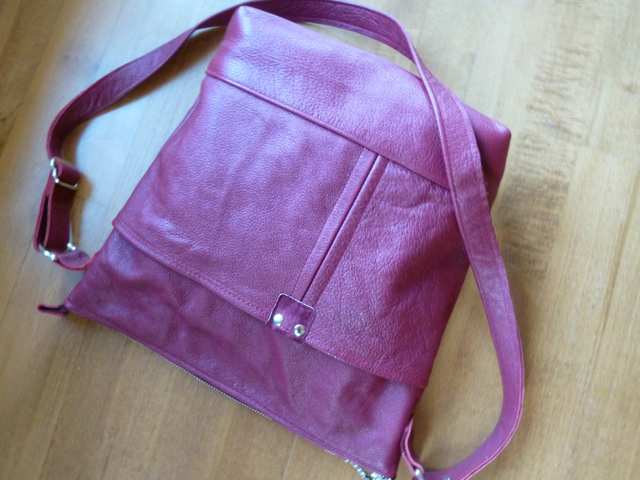 I’ve made versions of this bag before, but somehow the leather, the stitching and the proportions all work beautifully on this one. 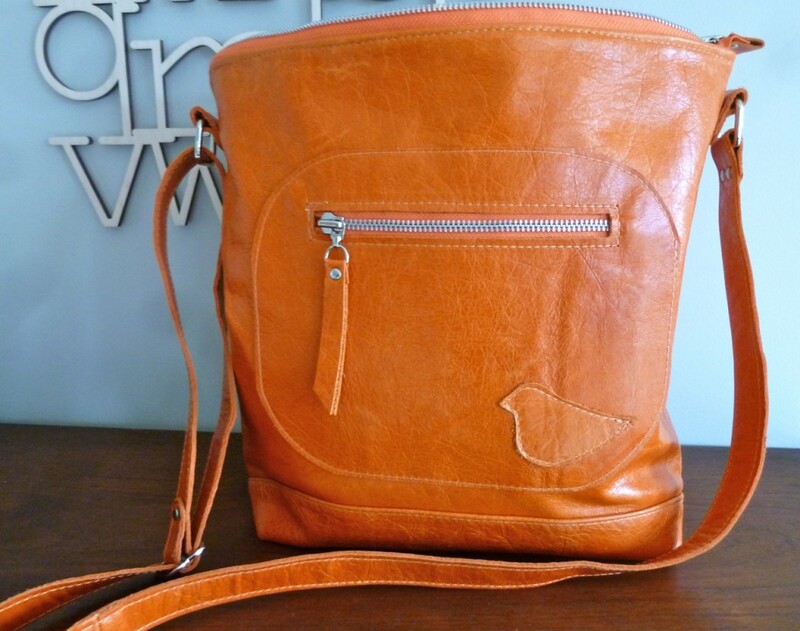 Carissa has been after me to ‘sign’ my work–so I decided to apply a leather bird to the front. 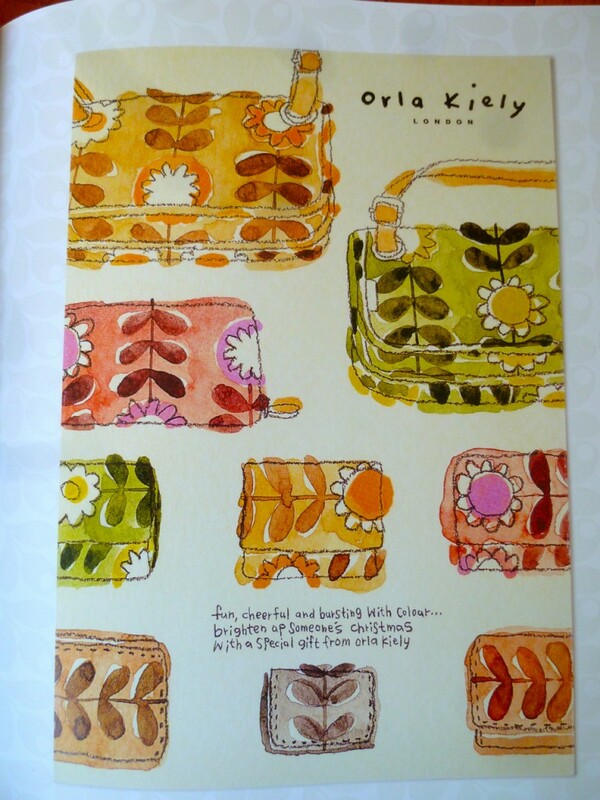 This version will not be the final one–it is actually a template for my dyeing–but I like the idea. It’s subtle but identifying. 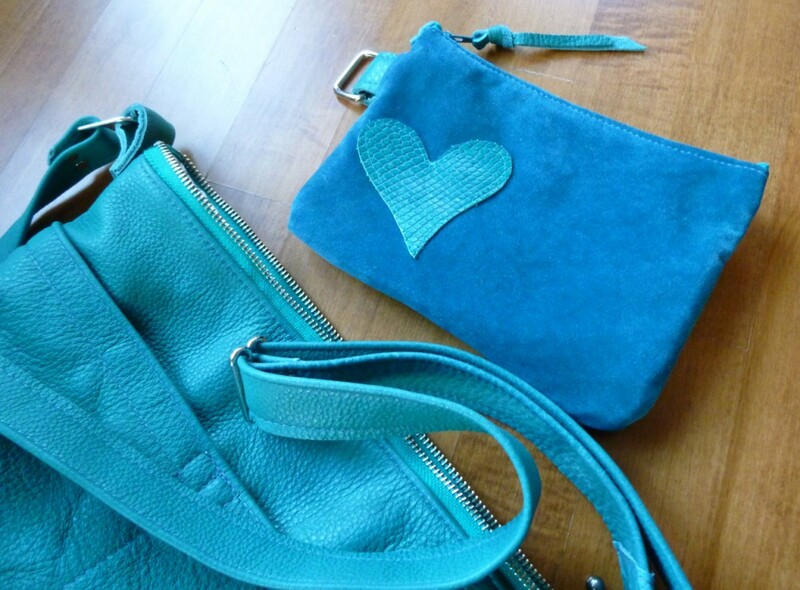 The leather was two remnant pieces I have had for some time, durable and great to the hand. 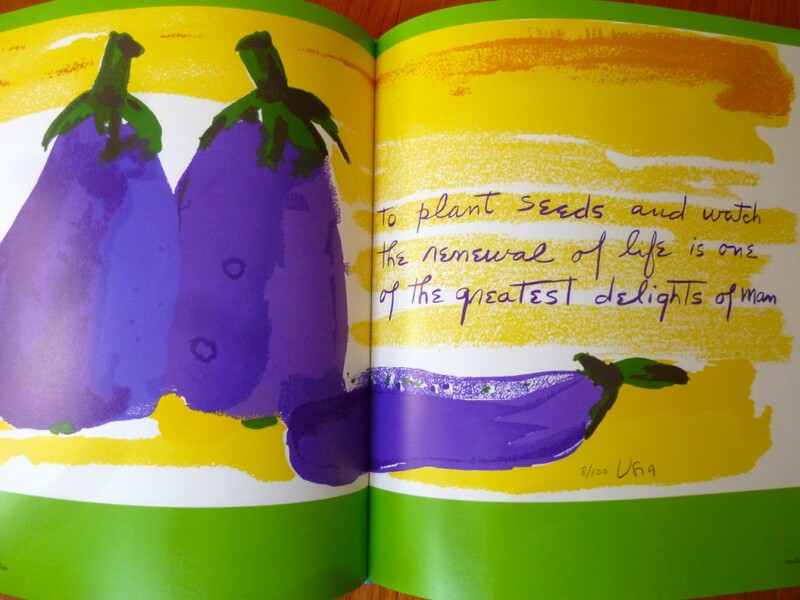 It measures 12″ x 14″ x 4″. A few changes in the interior too. 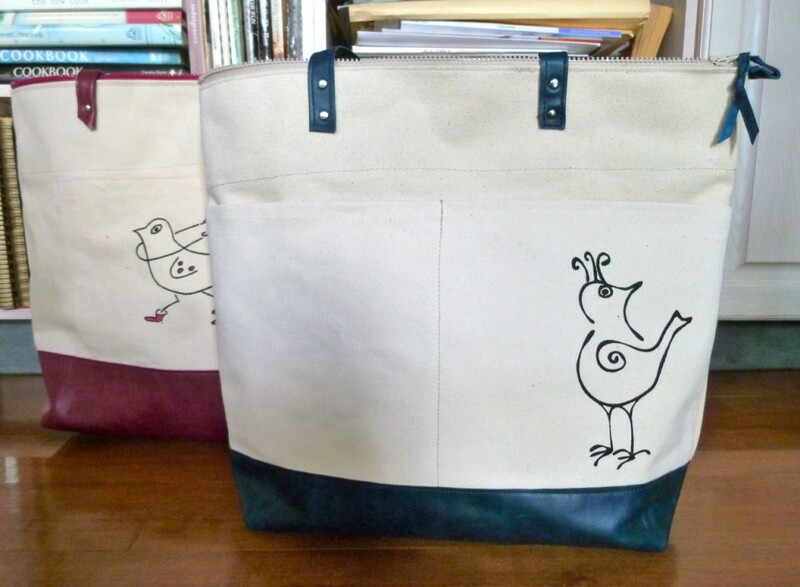 Below are two new canvas totes, Bird with Attitude and Bird in a Hurry. 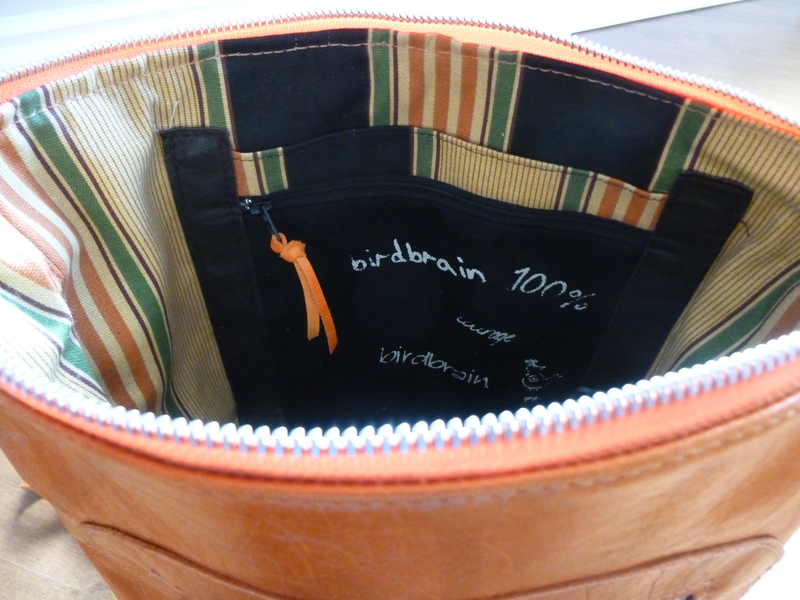 I made myself a prototype of this bag some time ago and I have found it an excellent size for toting all my gear or filling with market produce. 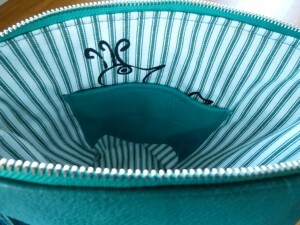 They each feature leather handles, outside pockets and an interior zipper pocket. Things have not been so busy that I haven’t had time for the important things–Margaret Atwood last night in Picton, delightfully incisive in support of important County projects, both natural and cultural, and today the One-of-a-Kind show. These books are by my bed and I am soaking in their inspiration. 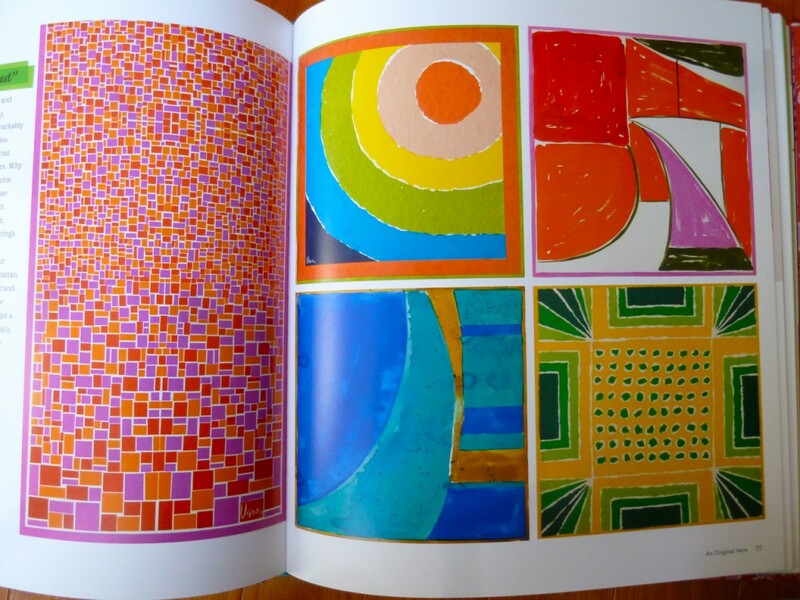 I remember Vera from the sixties, and wish I had kept the scarves I so loved then for their bright graphics. 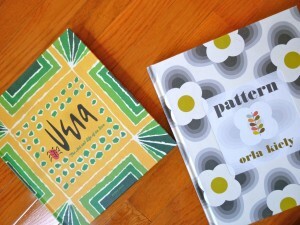 Orla Kiely is a new discovery. 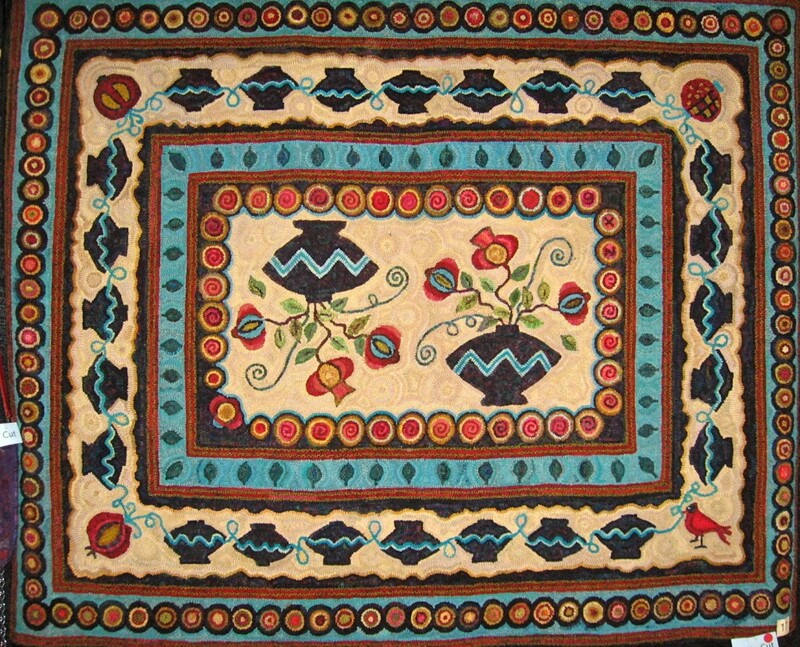 The watercoours of her work are lovely. 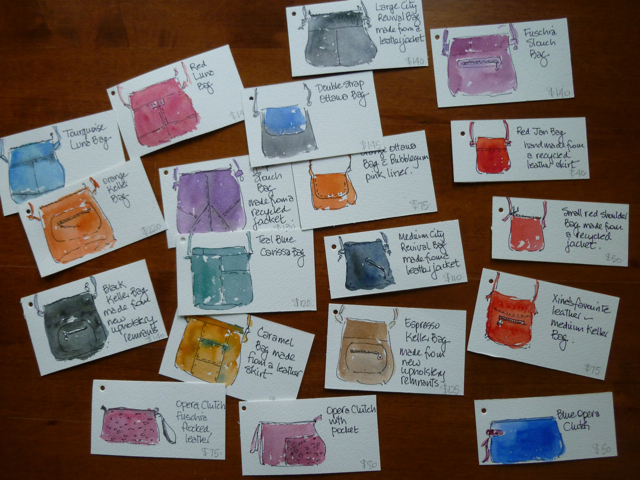 I plan to do a small watercolour on the tag of each bag for my show this weekend. I am going full steam to get everything done but want to make time for this. Fingers crossed. 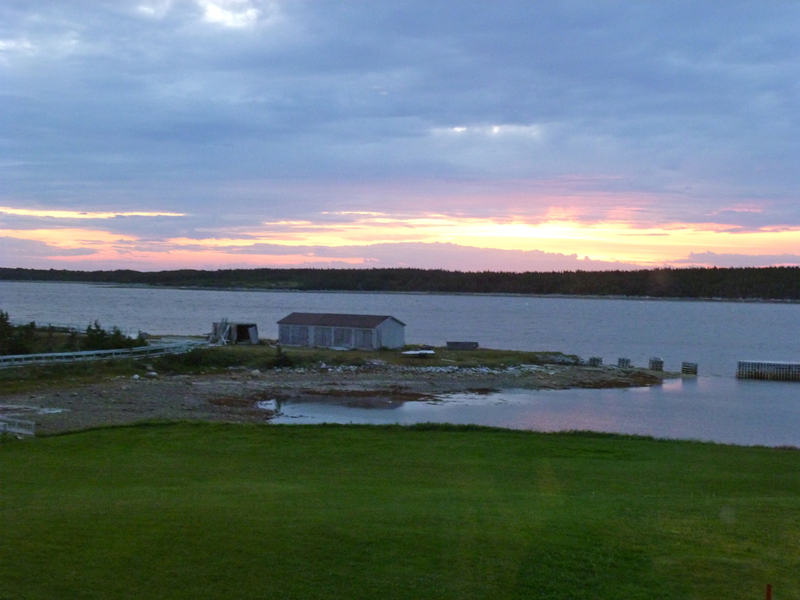 At bottom is a shot of colour from the studio. Yesterday we had our family sale in Kingston–thank you to all you attended. Next week it is here in Belleville. 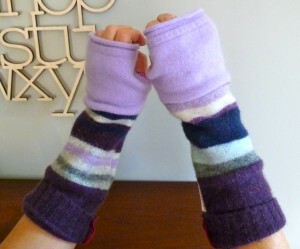 So I’ve been making mittens and experimenting with fingerless gloves. With the latter, it is all about length and I think my small ‘focus group’ — thank you Miranda — has convinced me that shorter is better. I’ll be making more this week. They are cozy, mostly made of cashmere, leave fingers free, and add a welcome shot of colour on these drab November days. 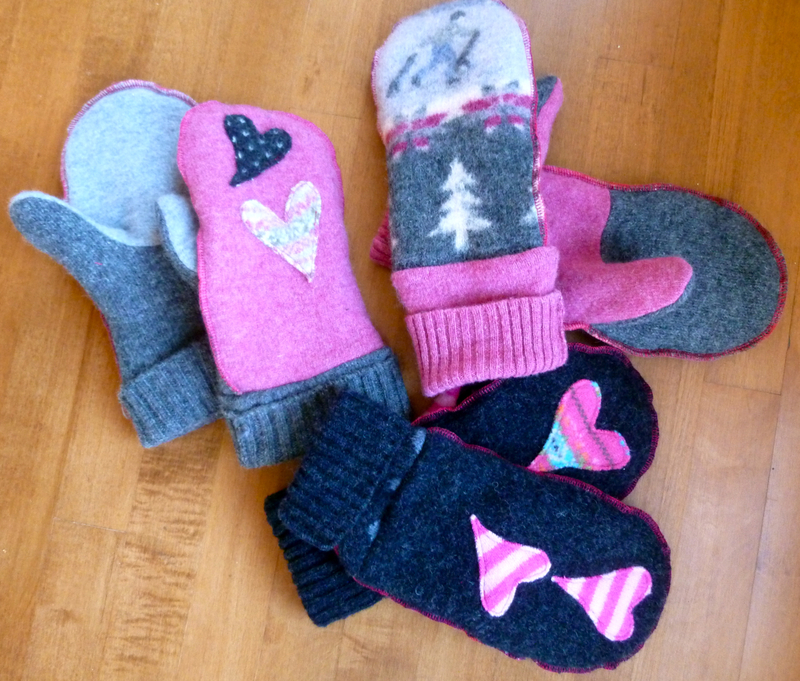 Colour always helps and a few hearts sprinkled on mittens can’t hurt either! I was in Toronto yesterday for supplies. 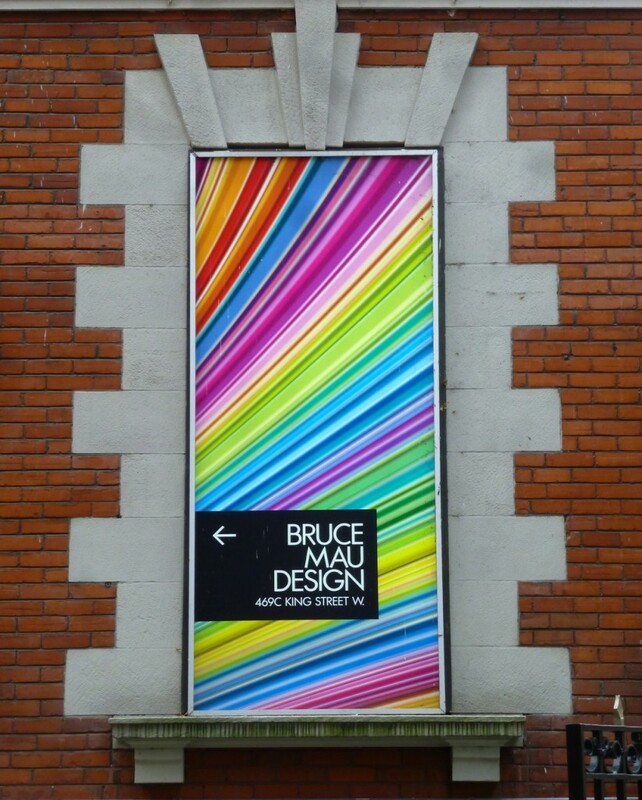 As I walked along King Street, I was taken with Bruce Mau’s sign–the juxtaposition of the classical window frame with its ordered proportions (what a great rug border!) and the wild rainbow of curving colour. Mau’s 1998 Incomplete Manifesto for Growth is provocative reading–and something I return to over and over again. 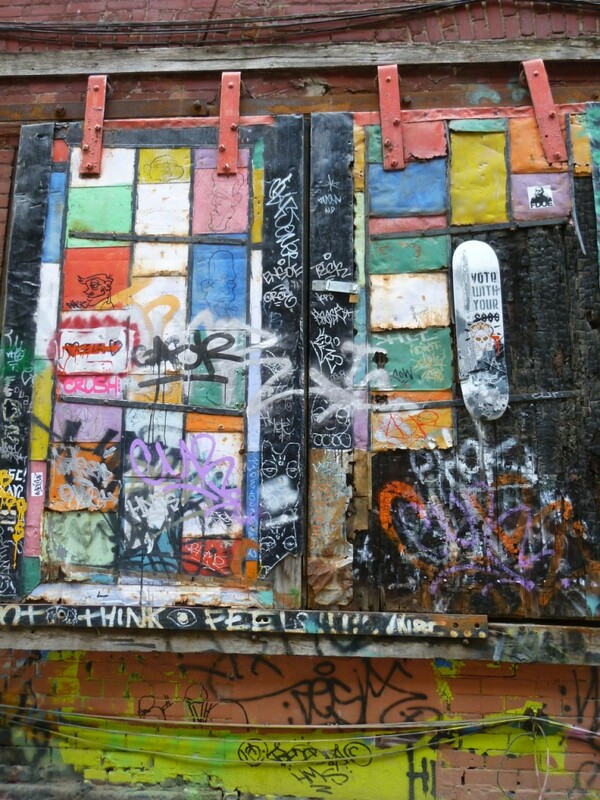 The graffiti art off Queen Street is amazing–and I half expected Rick Mercer to appear mid-rant. Lots of design inspiration for hooking on these streets. 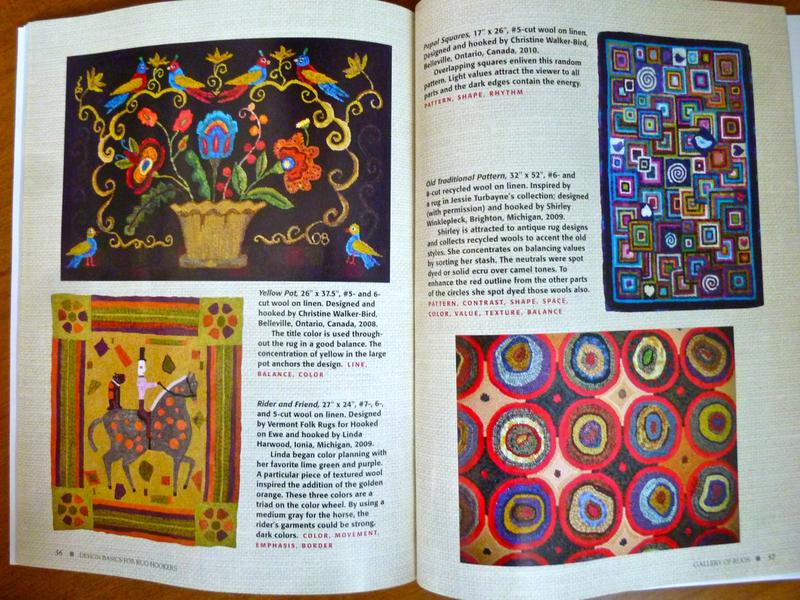 And speaking of design, a wonderful new book arrived in the post today. 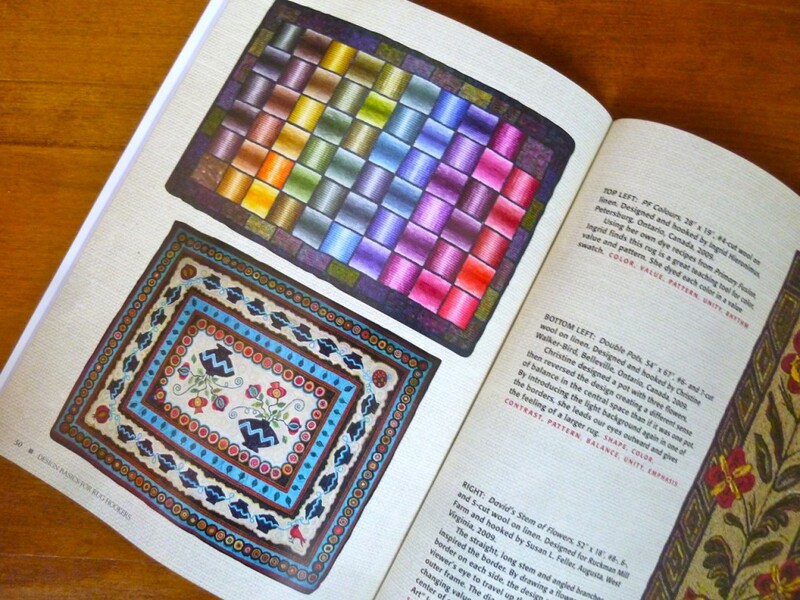 Wendie had alerted me in a comment she made yesterday, but this was my first peek at Susan Feller’s new book. and two more. 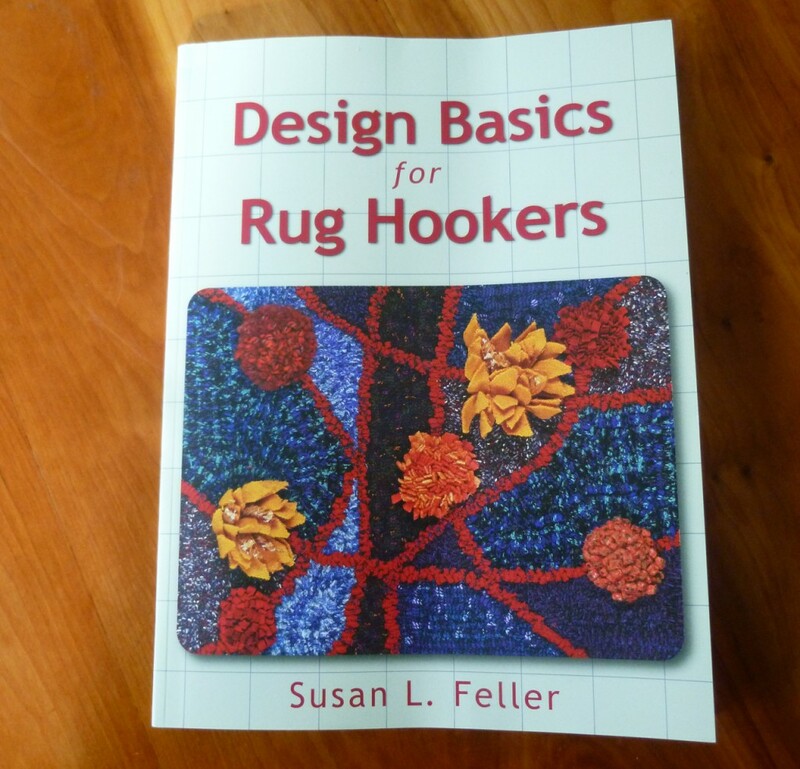 Susan’s book is full of wonderful design lessons–it is a ‘must-have’ for all rug hookers. It is available from Stackpole Books and soon on Amazon. 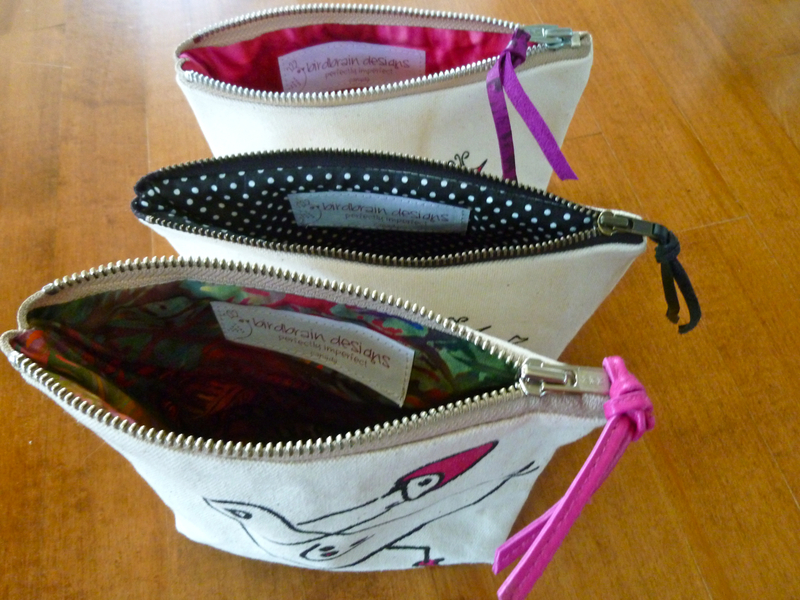 I made a few new bird with attitude pouches to take to the Gallery 121 xmas show along with some new mittens. 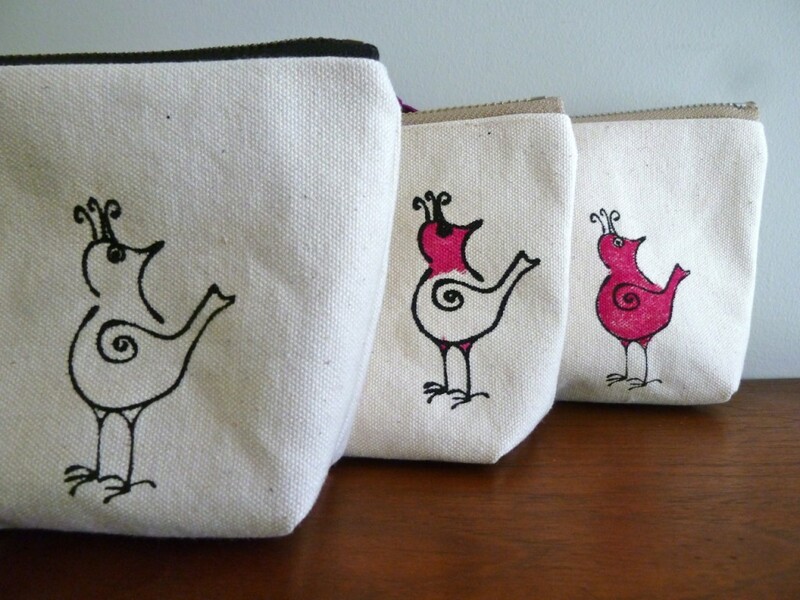 I was thinking about why these little canvas pouches are so much fun to make. 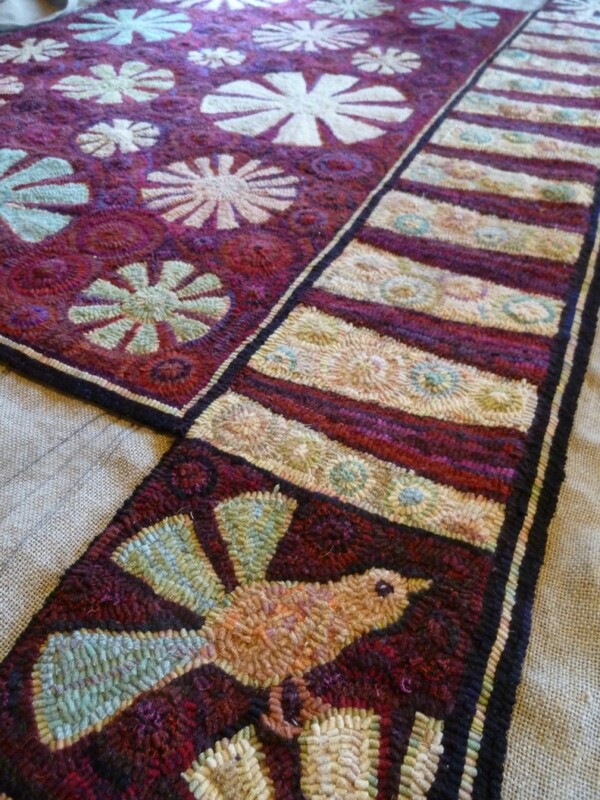 I like screening and then painting that cheeky bird–yes–but the most fun is choosing a lining, and I like to make each one different. I want the owner to have a smile when they open the pouch. 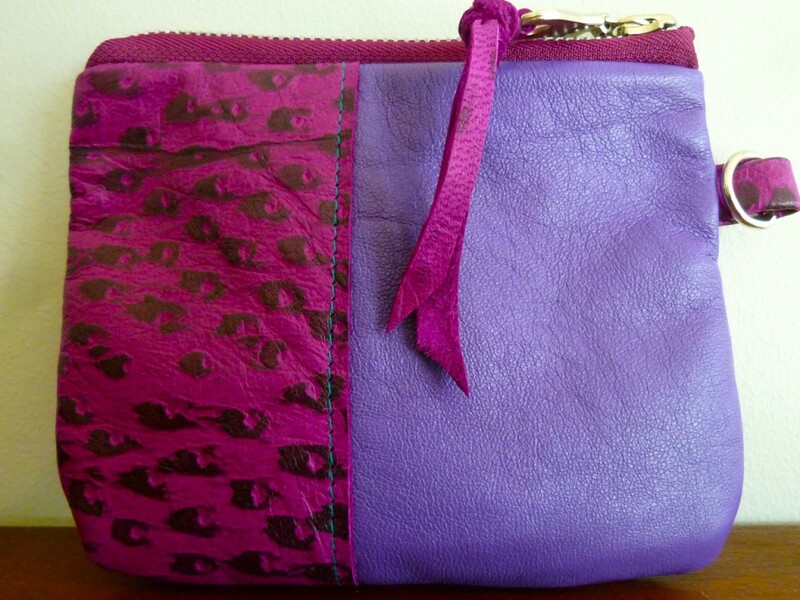 The same is true of my leather bags–I always try to have a surprise inside–usually a bird peaking out at you with an impertinent look. Linings are also key in my mittens. 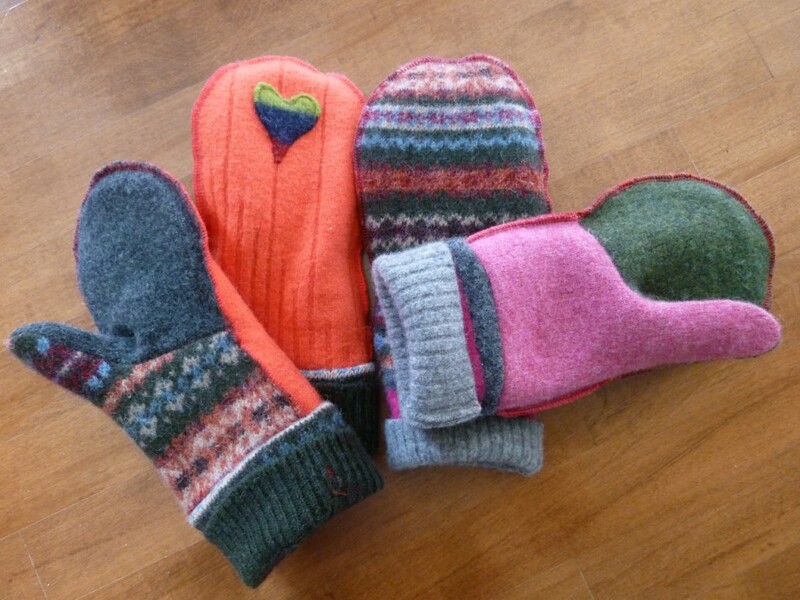 The outsides are made from assorted recycled sweaters which have been fulled–washed in hot water, rinsed in cold and popped in the dryer. 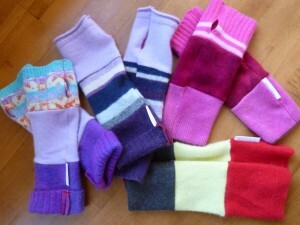 This helps the fibres snuggle in beside one another to give the wearer added warmth. 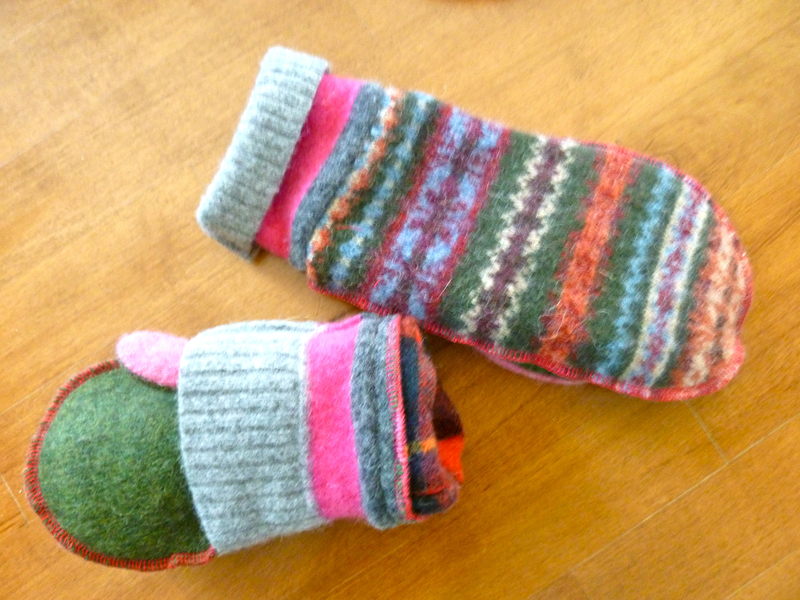 But the linings of these mittens are recycled scarves, always 100% wool and sometimes cashmere. The lining you see peeking out here is a scarf my dear friend June found for me in a thrift shop, a Ralph Lauren, complete with monogram, 100% wool made in Scotland. The lining is the best part! I have been enchanted by the moon these nights, and it is still in full beauty when I get up to go to the studio so there is a little moon glow in this bag. 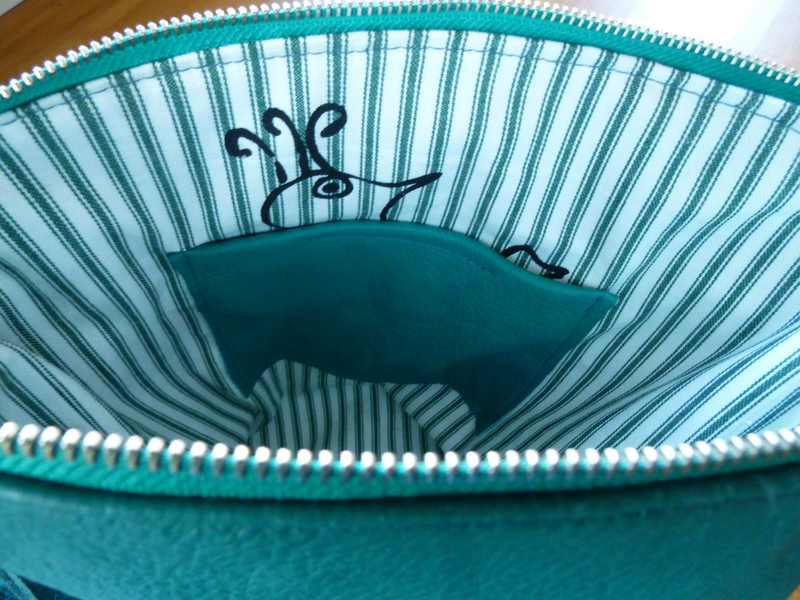 It is made from beautiful turquoise leather with two big pockets on the front and 3 inside pockets, the bird with attitude peaking out from behind the leather slip pocket. 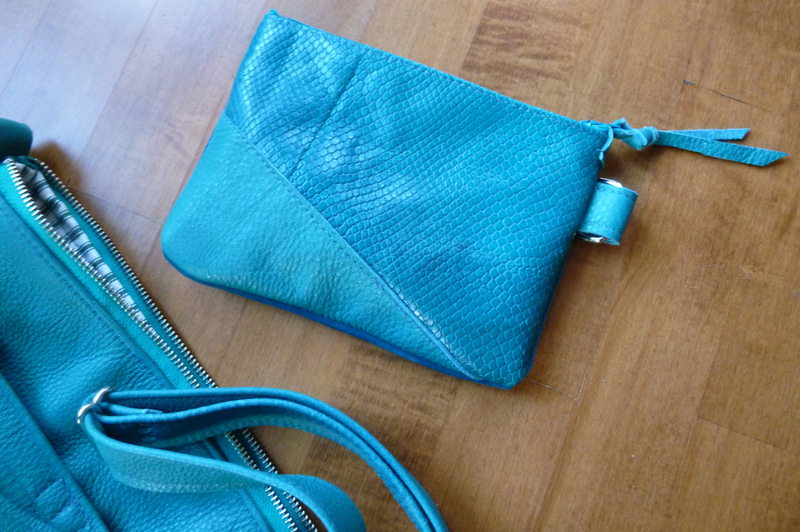 I found a blue suede skirt at VV this week, so incorporated it into a matching pouch.The bag is 13″ x 13″ x 4.5″ with a long adjustable strap and a zipper closure. I will have trouble parting with this one.